“Where you don’t have to have a good time to drink!” But folks tend to do so anyway. 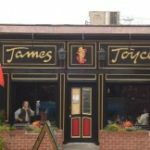 Established in 1998, James Joyce offers an authentic Irish pub experience with food and drink from both sides of the Atlantic. If we’re not talking about you when you get here, we will be after you leave.